Stratford upon Avon is interesting as it is the Scene of the Birth, Death and Sepulture of Shakespeare. Three doors from Inn, is the House where he was born, as small and mean, as you can conceive. They shew Us an old Wooden Chair in the Chimney Corner, where He sat. We cut off a Chip according to the Custom. A Mulberry Tree that he planted has been cut down, and is carefully preserved for Sale. The House where he died has been taken down and the Spot is now only Yard or Garden. The Curse upon him who should removed his Bones, which is written on his Grave Stone, alludes to a Pile of some Thousands of human Bones, which lie exposed in that Church. There is nothing preserved of this great Genius which is worth knowing—nothing which might inform Us what Educations, what Company, what Accident turned his Mind to Letters and the Drama. His name is not even on his Grave Stone. An ill sculptured Head is sett up by his Wife, by the Side of his Grave in the Church. But paintings and Sculpture would be thrown away upon his Fame. His Wit and Fancy, his Taste and Judgment, His Knowledge of Nature, of Life and Character, are immortal….From a letter when Adams and Thomas Jefferson visited Stratford-upon-Avon. Jefferson wrote nothing about the occasion except a record of his expenses. Perhaps we should despair of ever bridging the vertiginous expanse between the sublimity of the subject and the mundane inconsequence of the documentary record. Conceived out of the fullest heat and pulse of European feudalism—personifying in unparalleled ways the medieval aristocracy, its towering spirit of ruthless and gigantic caste, with its own peculiar air and arrogance (no mere imitation)—only one of the “wolfish earls” so plenteous in the plays themselves, or some born descendant and knower, might seem to be the true author of those amazing works, works in some respects greater than anything else in recorded literature. The impression that we could hardly evidence of Shakespeare’s life, is often circulated but false. The opposite is true. But all the documents relating to the unsophisticated staid citizens from the Middle English Province, who became involved in various legal disputes, are so far away from how we prefer to think of a great poet, that the historical tradition disappoints us. For real estate matters, it does not need a genius. It is the banality of the Bard, which makes the problem of all the Shakespeare's biographies. I am “sort of” haunted by the conviction that the divine William is the biggest and most successful fraud ever practiced on a patient world. The more I turn him round and round the more he so affects me. But that is all—I am not pretending to treat the question or to carry it any further. It bristles with difficulties, and I can only express my general sense by saying that I find it almost as impossible to conceive that Bacon wrote the plays as to conceive that the man from Stratford, as we know the man from Stratford, did. The very idea that the Earl of Oxford would have written the world’s greatest masterpieces without wishing anybody to know it seems to me also a psychological absurdity – and then of course the people who conceive this notion positive, that somehow he left little clues here and there, which nobody picked up until three hundred years after Shakespeare had died. There is no evidence whatever that would persuade any rational person that the Earl of Oxford wrote the plays of Shakespeare. I am not concerned with who wrote the works of Shakespeare, but I can hardly think it was the Stratford boy. Whoever wrote them had an aristocratic attitude. His utter disregard for grammar could only have been the attitude of a princely, gifted mind. The learning of Shakespeare was quite sufficient to write these pieces, he was not learned “immeasurably” but he was just gifted with a boundless imagination ... and all other theories have just considerable difficulties. 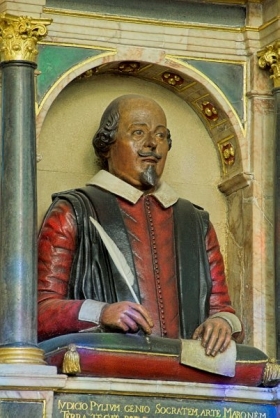 Therefore William Shakespeare from Stratford is still the safest candidate as author of the famous plays, even if he possessed no academic education. The name “William Shakespeare” is most probably a pseudonym behind which there lies concealed a great unknown. Edward de Vere, Earl of Oxford, a man who has been regarded as the author of Shakespeare’s works, lost a beloved and admired father while he was still a boy, and completely repudiated his mother, who contracted a new marriage soon after her husband’s death. Oxford did not write anonymously. He was published under his own name in his lifetime. None of his plays survives and his poetry is unexceptional. Nice of him, then, to make the single greatest contribution to English literature as somebody else, while taking credit only for his weakest material. - And all this idle speculation because we cannot accept that Shakespeare was a middle-class Brummie. That this brilliance, this imagination, this gift for creation came from the mind of an ordinary citizen, not a member of the gentry.